Don’t you hate it when things don’t go according to plan? I went to bed on Sunday with my work clothes all picked out and a slow cooker of onions caramelizing away, but after I woke up with an unbelievable headache and then suffered a coughing fit that left me dizzy, I decided to call in sick. After downing some ibuprofen and an Emergency-C and forcing myself to sleep for a few more hours, I checked on the onions I had been caramelizing in the slow cooker over night. As much as I hate it when my plans get ruined, I double-hate it in the kitchen. I hate wasting food because it means wasting money, and I hate wondering over what went wrong – especially, as here, where it’s a technique that has worked for me before. 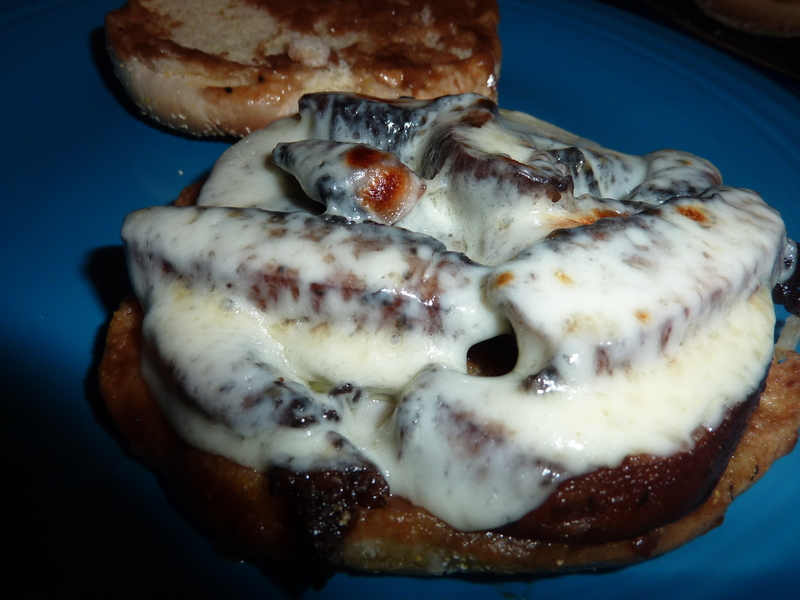 I’d had my little heart set on making this roasted mushroom sandwich with onion gravy for several days. Thus, I forged ahead. The extra step of recaramelizing the onions was well worth it, because this sandwich was pretty darn good. 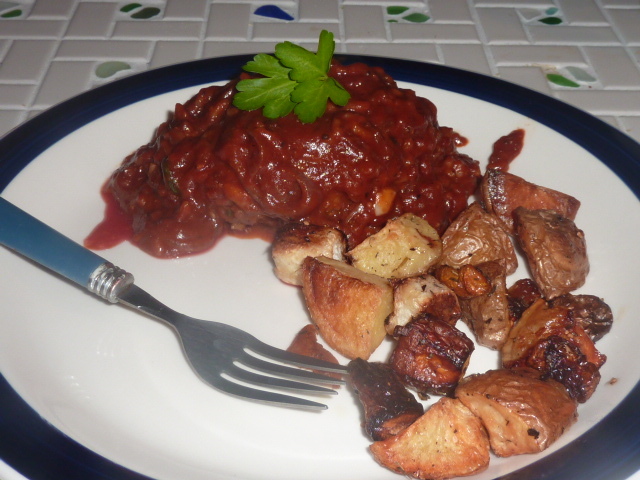 The roasted portobellos in combination with the rich caramelized onion gravy was meaty and comforting. Though I used chicken stock (because it’s what I had on hand), you could easily substitute some dark vegetable stock and make this a vegetarian sandwich that any meat eater would be happy to scarf down. The depth of flavor is really quite impressive, largely due to the extra step of caramelizing the onions. Roasting the mushrooms also brings out their natural meatiness, leaving them juicy with enough of a chewy texture to remain satisfying. In a large sauté pan with high sides, add butter and olive oil over medium heat. Once butter is melted and frothing, add the onions and stir to form a uniform layer. Season with salt and pepper. Continue to cook over medium heat, stirring every 1 minute to 2 minutes, until the onions are a deep mahogany color and are caramelized. This will take about half an hour to forty minutes. If necessary, add more olive oil or butter in order to keep the pan from drying out. You do not want to stir constantly, as this will prevent the onions from browning; nor do you want to stir too infrequently, as this will allow the onions to burn and become bitter. If the onions have dried out when caramelized, add another tablespoon or two of olive oil along with the butter. Stir to evenly coat the onions and add balsamic. When butter is melted, sprinkle flour over the onions and necessary and whisk to combine. Constantly whisking, slowly add the chicken stock. Stir until smooth and reduce to desired consistency. Add Worcestershire and taste for seasonings, adjusting as necessary. If necessary, add another splash or two of chicken stock to maintain desired consistency. On a tinfoil lined baking sheet toss mushrooms with olive oil, powdered garlic, salt, and pepper. Place in oven and roast 12-15 minutes, tossing once or twice, until the edges of the mushrooms are golden brown. Place hamburger buns sandwich side down in the caramelized onion gravy and allow to soak for 1-2 minutes. You don’t want the buns to be mushy (unless you want to make this a fork and knife sandwich, which is totally acceptable), but you do want them to absorb some flavor. On the bottom bun, use some tongs to place a few onions on the bun. Add the mushrooms and top with a slice of provolone cheese. Place under the broiler for one minute until cheese is melted and golden brown in spots. Top sandwich with other half of the bun and serve immediately. Salisbury steak was one of my favorite meals when I was younger. I don’t think my mom made it very often, but I do remember really enjoying it when she did. So, when I saw this recipe on One Perfect Bite, I knew I had to try it. Rather than serve it with mashed potatoes, rice, or noodles, as is traditional, I decided to pair it with some roasted root vegetables in order to use up some of our CSA bounty. The flavors of the sauce in this recipe were out-of-this-world rich and delicious, and the root vegetables were perfectly crispy and golden brown on the outside and soft on the inside. I loved the vintage, throw-back feel of this meal and it was great comfort food on a snowy, frigid day. I only simmered the Salisbury steaks in the sauce for about ten or fifteen minutes to begin with and they were not fully cooked through, so we had to add them back to the pan. Be sure to check that they are cooked to your liking before serving by cutting into the thickest part of one of the steaks or using a meat thermometer. Add olive oil and butter to a large sauté pan over medium-high heat. Once butter is melted, add onions and garlic and season with freshly cracked black pepper. Stir to coat with butter and olive oil. Cook over medium-high heat until onions begin to turn deep golden brown, stirring occasionally, about 15-20 minutes. When onions are slightly caramelized, add 1/4 cup turkey stock. Reduce heat to a low simmer and cover. Check frequently and add stock as necessary to prevent liquid from totally evaporating and caramelized bits burning. Simmer until onions are deeply caramelized This may taken anywhere from 15-30 minutes minutes. Allow any beef stock remaining to evaporate completely. Stir in flour and cook 2 minutes. Add wine to deglaze pan and reduce by half. Stir in remaining turkey stock, tomato paste, sugar and apple cider vinegar. Simmer ten minutes to allow flavors to meld. Taste and season with kosher salt and freshly cracked black pepper to taste. Reduce heat to low in order to keep warm. Mix ground beef, rice, egg yolk, kosher salt, freshly cracked black pepper, garlic, Worcestershire sauce, parsley, and thyme in the bowl. Shape into 2 oval patties about 3/4″ thick. Heat olive oil in a large skillet over medium-high heat. Sear patties 3-4 minutes per side until crust is formed. Pour gravy over patties and simmer an additional 15-20 minutes or until patties are cooked through. Serve topped with onion gravy and a sprig of parsley. Line a baking sheet with tinfoil and place all vegetables on a single layer on the baking sheet. Drizzle with olive oil and toss to coat. Season with dried thyme, kosher salt, and freshly cracked black pepper. Place in an even layer. Add to oven and roast 45 minutes, turning every 15 minutes, until brown and crispy.